Happened across this while in a hurry to grab a book and go, and it ends up being really enjoyable! Great character development, and Jeffrey Kafer's narration was right on. looking forward to the rest of the series! Ok, yeah, I hate sports metaphors as much as Dr. Cameron, but I honestly felt like I had to shout something in the headline for this book! 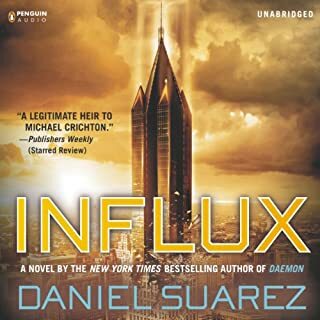 Influx was such a fun book that it kicked me into a whole new genre of science fiction that I hadn't been that interested in before. The only reason I didn't finish this one off in one go was that I wanted to stretch it out as long as I could so it wouldn't end. Physics, tech, action, and some great characters all blended like a perfect margarita. The narration by Jeff Gurner was great as well, making this well worth a credit. I would recommend this book to any science fiction fan, and to thriller fans who might be thinking of testing the waters of books with a science fiction edge to them. There are no epic space battles or alien love scenes. This is science fiction of a much more "realistic" sort that might be just right for bridging the gap and introducing science fiction to those who might consider themselves "Sci-fi-curious". I will keep this short and write a more complete review at the end of the series, but I have to jump in and say WOW, what a fantastic couple of books so far! Incredible story, enjoyable characters, edge of your seat-nail biting parts and parts that truly made me laugh out loud. I had no idea what to expect, and I have a hard time breaking in a new series by a new author, but this just grabbed me and didn't let go! I wish I had extra thumbs so I could give it more than just two thumbs up. Also, I can honestly say that out of my entire collection of audiobooks, Nick Podehl does the best job narrating, dare I say PERFORMING these books! I have not heard talent like this since Robert Inglis reading the Tolkien series. Not only are the voices and accents he picks for the characters clear and distinctive, he matches them perfectly to the characters, and has almost as many different voices an Mel Blanc! The stories would stand out on their own, but Mr. Podehl has added a level of enjoyment to these books that I feel truly completes the whole experience. It saddens me that I am not articulate enough to properly express how brilliant this performance is. If you are at all on the fence about this series, or if you just came across them, I give them my highest recommendation. You will truly enjoy this series! I too was not sure about the more "modern setting of this new series, but I ended up being surprised at how well it worked. I truly enjoyed the characters, the story, and the new world. Or would it be the older world? Depends on how you look at it I guess, but it is the same world as the original series, just 300 years after the end of the last book. I thought the bits and pieces of the original story were tied in cleverly and not overdone. There was also some good humor in the dialogue between two of the main characters, and of course, that dialogue was brilliantly performed yet again by Michael Kramer. Overall, I loved it and am looking forward to the next one. However... It was way too short. I know that any book you really get into can seem short simply because you don't want it to end, and while that is true for this book, this one really IS too short. I was so excited it was out I just bought it straight away, but when I went to download it I honestly though something had gone wrong and I was missing the other two parts! I can see why a big new release like this was only one credit, but even so I felt like I should have a bit more book for my buck. I hope this is a one time occurrence and the rest of the series will be back up to size. Still, I thoroughly enjoyed what was there, and will just keep fingers crossed for the next one. Since this is the first book of the first 3 book series, I will give a review that encompasses both the book, and the series as a whole up to book 3. 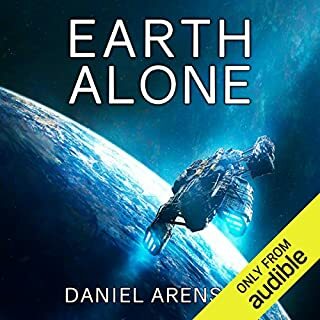 Of course, here we are talking about the audiobook version, and I am truly happy to say that Michael Kramer does a masterful job as narrator. With a fairly large number of main characters, he gives distinct voices and accents that really add something to the story. (The character of Sazed was perfectly read) listening to these books was like watching a movie with a fantastic cast of great actors. I just can't properly express how much I enjoyed Mr. Kramer's performance. I apologize for such a poorly written review, but don't let my lack of talent take away from the overall point of my review! 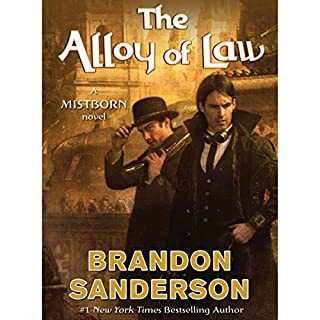 This is a fantastic series, wonderfully written and performed, and I urge everyone to give it a listen, even if you have already read the printed books. 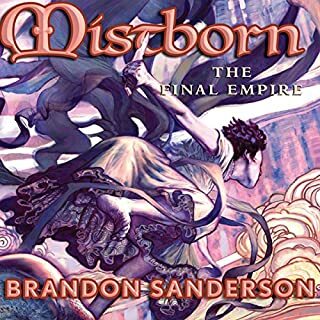 With the Mistborn Trilogy, you get both a great story and a great performance, and that is money/credit well spent. 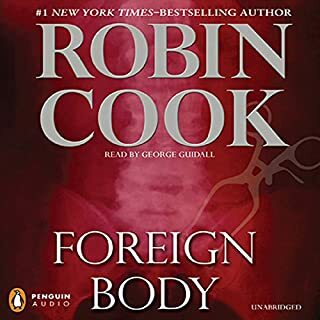 In this chilling new novel from the one and only Robin Cook, New York City medical examiners Laurie Montgomery and Jack Stapleton rush to India to help a UCLA student investigating medical tourism - and a sinister global conspiracy. This is one of the slowest, if not THE slowest Robin Cook story, at least in the series with Jack and Laurie. For one thing, less than 3 hours remain in the book before Jack and Laurie really make an appearance. The feeling I got is that instead of the story being set up in the beginning and then the rest of the book following the "heroes" as they work to solve the mystery, this one spends the first 85% of the book setting up the story, with the main characters coming in only at the end. I hate to say anything negative, but none of the characters grab you, and the story takes way too long to get moving. I felt the previous book "Critical" moved a bit slow, but it moves a LOT faster than this one. As far as the narration, I didn't think it was all that bad. Maybe his Indian accent isn't that great, but it didn't bother me. I find it more distracting when the narrator goes over the top with accents. George gives enough of an accent to get the point across, but he keeps the focus on the story and keeps it moving. I got all the way through it, but it was certainly not one of Robin Cooks greatest hits. I am really hoping the next books go back to the way they were in the beginning of the "series". I really love this book. It is at least as good, and maybe even a little better than the rest of the series. As the first prequel to the two five book series, it gives you a detailed background of one of the main characters, as well as fill in the details of some of the past events that are often referred to in the original stories. The character of Belgarath was one of my favorites, so I was glad to have a book that was mainly about him. However, as has been stated by almost ever other reviewer, the narration is just awful. I feel terrible for Mr. Linton getting hit so hard in these reviews, but the least he could have done was listen to a book or two from the original series to get the pronunciations of the names straight. It is very hard to tell the difference between voices, and so conversations can be confusing. There are often no pauses in between lines spoken by different characters so instead of sounding like a conversation it sounds like one big long run-on sentence with no puctuation. 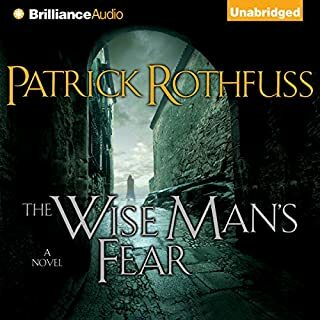 (Like that) I also went straight from the last book in the series on to this one, and the quality of the audio did not help the already terrible narration. Of the many audiobooks I have listened to, this was, I am very sorry to say, the worst narration I have heard. Still, it is a great story, and if you are a fan of the rest of the series, you will most likely enjoy this one. I have found that after a while, if the story is good, the narration becomes easier to live with, and one can still enjoy the book. I enjoy all of Edding's books, and this series is one I have enjoyed for years. When I decided to get the audio versions, I didn't read the reviews or even look at who was narrating because I know the books well enough to get past any issues I had with the narration. There are ALWAYS going to be differences in the way names are pronounced in Fantasy books, as so many of the names are made up and unique. In other reviews, several people have commented that the narrator of the last three books was pronouncing all the names 'wrong' based on the first three books narrator's pronunciations. If you have never read the books, and only have the narration of them to go on, I can see how this would be confusing, and really, the best thing is to keep the same narrator through an entire series, but for whatever reason, that did not happen this time. However, based on the way the names are spelled, the second narrator was much better IMHO. The problem I had with the narration of these last three books is the voices. He makes the princess sound like a moron who is always on the edge of a giggle. Most of the voices don't really fit the characters, and even more so if you are used to the first narrator. I don't feel it is bad enough to keep many people from enjoying the books though. 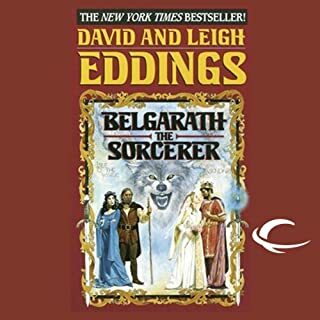 If you like Eddings books, these last three in the series are great, and a nice way to wrap things up. Even with the bad voices, I still enjoyed them overall, and the pronunciations were so much close to what I thought they should be, I enjoyed the last three MORE than the first three. 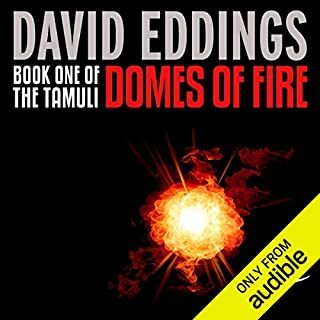 Definitely worth a listen if you are an Eddings fan. 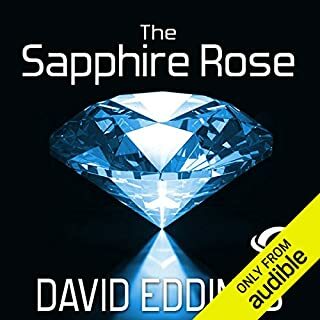 The Sapphire Rose wraps up the first three books in the adventure of Sparhawk and his companions. You get to learn a lot about things that you really need to know if you are planning to dive into the next three books, The Tamuli. I enjoy all of Eddings books for what they are. You might read reviews that say they are for young readers, or they are not very deep, but I don't really agree. It seems like some people expect all fantasy series to come close to Tolkien's books... Eddings writes books not FOR young readers, but books that ARE able to be enjoyed by either younger readers or people that might be new to fantasy. You won't need a companion guide in order to enjoy these books and keep up, but they are far from shallow, and great light reading. The narration is good. With fantasy stories, there are always names of people and places that if you have read the books before, you are likely to have pronounced differently in your head. I expect this whenever I get a fantasy audio book. For example, the character name "Platime" to me looked like it should be "plah-TIME", but the narrator pronounces it "PLAT-im". It really is not a big deal, even if it bugs me a little, it doesn't take away from anything, and if you have never read the books, it won't matter at all. There are some words that DO have a correct way they are pronounced that he gets wrong that he really shouldn't, for example, "Hogshead" (as in a hogshead of ale), he pronounces as "Hog-Shed". (which would be a small building where pigs live) but again, not a big deal. In fact, the only real problem I had was that there are two characters who's voices he does that sound exactly the same, even though one is male and the other female. The two are together enough for it to be a little confusing. Overall, he does a good job, and I will definitely move on to the next three. 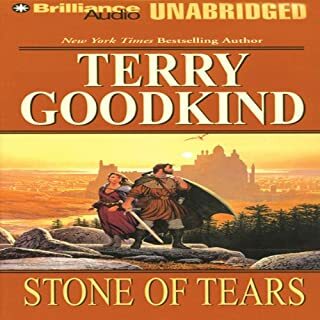 The SOT series is fantastic, and Stone of Tears as the second book is a good continuation of the story, though I thought not as exciting as the first book. Still, I enjoyed it all the way through. I feel sorry for Jim Bond's narration getting slammed so hard, but the truth is... it is pretty bad. I did eventually get used to it, and the story is so good that even though the narration bugged me, I enjoyed listening anyway. It would have been much better to stay with one narrator through the whole series, as you start to recognize charaters by the voice the narrator uses (when done well anyway) but that is not the case with this book. Nonetheless, I still give it a good review because the story is great, and there is much more to come in the series. As to it being dark, I don't find it to be any darker or more disturbing than many books in the fantasy genre. There are certainly graphic descriptions of torture, (Though not as much as the firs book) but only enough to really get across the extent of what the character is forced to endure. This plays an important roll in what is to come, and I didn't find it to be too much. I will say that if you are new to the fantasy genre, or if you find books like the Harry Potter series "Dark", then this might be a bit more than you are used to.